The first mensa (refectory/cafeteria) app for Chemnitz in English! and wondered what the shown food was or tried to recognize it on the little pictures? 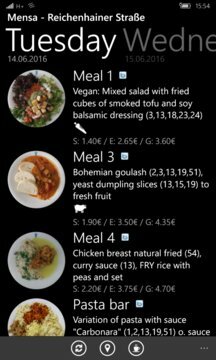 This app comes to the rescue and shows the menus of both the refectories of the university of Chemnitz in English. All meals which do not possess an official translation yet are translated using bing, so you'll always know what's there to eat. Don't ever wonder again what those German guys are eating. 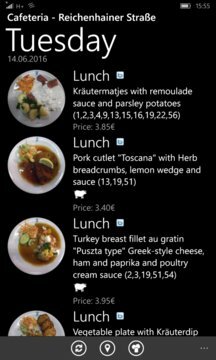 Now you can even view the menus of the snack bars and rate the meals directly within the app. Note: The rating function has been disabled by the Studentenwerk and therefore no ratings are shown at the moment.